The bell is ringing now for the start of the newest class from Anita's University. "I Can Quilt 201." Continuing with the success of Anita's University class, "Embroidery Made Easy 101," we're proud to introduce and teach the next class in the series. During this class we will deep dive into each and every one of our quilting techniques. You'll learn how Anita Goodesign saves you time, money, and fabric with our innovative in-the-hoop quilting techniques. 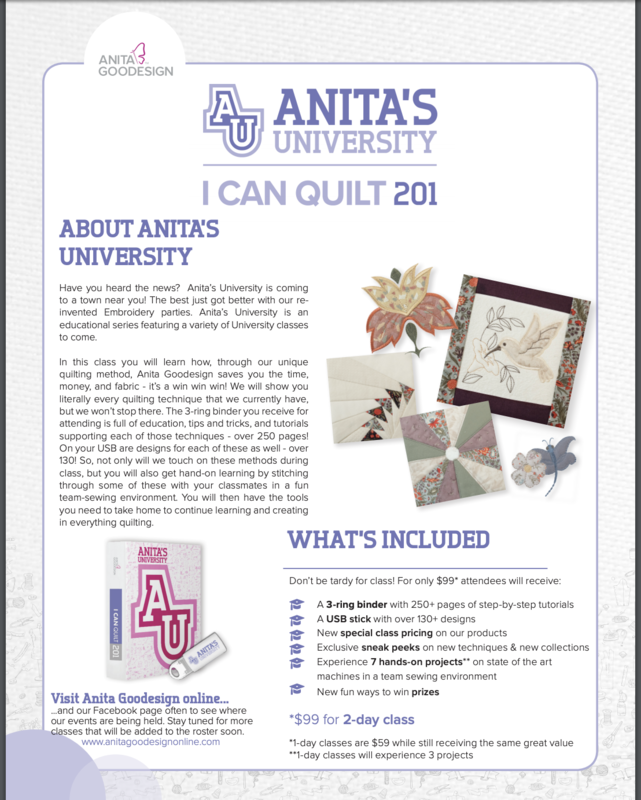 Whether you've attended Anita University 101, you'll benefit from the different designs, education, and projects in THIS new series of classes. Register before May 31st and receive TWO $10 Sew Right BONUS Cards.